ST. PETERSBURG, Fla. — When Heather Bailey saw the Star Wars toy, she knew just the little boy who’d love it. Bailey is a child life specialist at Johns Hopkins All Children’s Hospital — one of many pediatric-based hospitals around the country to receive hundreds of toys from Disney this week. The donations are part of a $100-million pledge the Mouse House has made to children’s hospitals nationwide. Over the next five years, Disney plans to unveil more ways to help improve the patient experience. Bailey and her colleagues have just started going through 12 boxes of new Disney toys, from Buzz Lightyears to Frozen princesses. 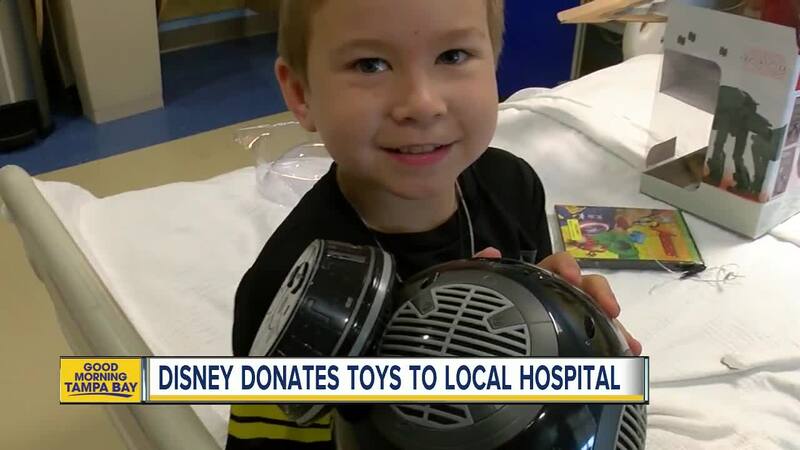 That Star Wars droid was given to Samuel, a 9-year-old on dialysis. “Our goal is to help the kids feel like they have a bit of normalization amid all the chaos they have going on with their health care,” says Bailey, as she helped Samuel get his shiny new robot out of the box and cruising around his room. For tiny Trinity, who’s about to start chemotherapy, she was given an Elsa doll to go along with her Minnie Mouse. The Disney shipment comes at a crucial time, as the hospital receives most of their toy donations around the holidays. The middle of the year? Not so much.